Fine Topaz Jewellery | Gemstone Jewellery from Rocks & Co. Happy birthday November babies! We have a gift for you at Rocks & Co. The gift is a news flash that hopefully, you are fully aware of. And that story is that gorgeous Topaz Jewellery, as well as stunning Citrine Jewellery, are both created from the gemstones that are your birthstones. Make sure to let all potential gift givers are aware of this important news. And if that is you, well then 'note to self'. These two gemstone varieties have a bit of a 1940s screwball comedy storyline in that they are completely different in chemical makeup but have been confused for one and other for years. And now to top it off they are both delegated as the birthstone for November's children. What they do have in common is their availability and reasonable pricing (except for the AAA Topaz of course). Topaz rates 8 on the Mohs scale of hardness and is a favourite stone of designers and jewellery producers. Extremely precious and rare AAA Imperial Topaz is a top quality precious exotic yellow gemstone. Found only in Ouro Preto, Brazil. It is rare coveted and collectable! This gorgeous yellow gemstone sits perfectly in a yellow or white gold jewellery setting. In Ouro Preto Brazil all of this Imperial Topaz comes from pegmatite rocks/mines. The pieces in this collection were extremely difficult to come across because of the high quality. Each piece has breathtaking colour saturation, clarity, crystallization and brilliance, this is the pinnacle of not only all Topaz but of all Imperial Topaz. Imperial Topaz sells for thousands per carat normally. This is a true opportunity that we have this gemstone. Blue Topaz earrings set in white gold are a cool classy combo. Kind of like Bogie and Bacall. Just class all the way. The beautiful white metal gives a natural highlight to the Topaz or whichever gemstone is paired with the precious metal. For a little more royal flash take your blue Topaz earrings set in yellow gold. A warm and sun-kissed precious metal gives the blue Topaz gemstone show-stopping pop. The extremely royal colour combination works with wedding invitations, gift wrapping, wallpaper, interiors, exteriors, clothing and of course jewellery. At Rocks & Co., it is relatively easy to create a jewellery set of earrings and a necklace. Simply type in or click Topaz and all of the jewellery types will be filtered. From there you are able to create a set based on gem and precious metal colours. The thing is to get into the gemstone flow and that means possibly matching a lighter coloured Topaz necklace with darker blue Topaz earrings or vice versa. The blues of Topaz are like the ocean and the different hues complement each other amazingly. Pink Topaz earrings are understandably coveted. The pink Topaz is as about as feminine as you can get. The colour looks good on everyone or rather makes everyone look and feel good. Giving off the love and some say resonating with the heart chakra. Natural rose or pink Topaz are like all Topaz, aluminium silicate, which includes fluorine and hydroxyl. Pink and red are the rarest of the natural occurring Topaz colours. Brazilian pink Topaz obtains its colour from chromium. Iron, manganese and titanium cause the pink in the gem. Some say that pink Topaz also called rose Topaz, looks similar to a pink diamond or a pink Sapphire. Pink Topaz is much less expensive than pink Diamond, and it’s often available in larger sizes than either Diamond or Sapphire making it much more accessible. You can find AAA Imperial Topaz earrings high-quality at Rocks & Co., and add these to your precious gemstone jewellery collection. These items are well worth the investment. There are many varieties of Topaz in our earring collection and many are very affordable! 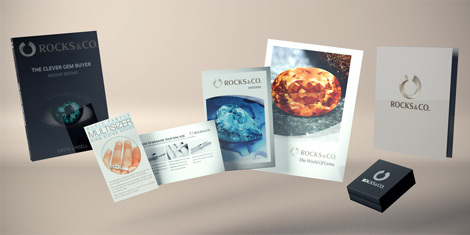 Some of the Rocks & Co.,Topaz varieties include Blue London, Swiss Blue, Sky Blue, Katlang Imperial, Neptune, Moonstruck, Moonlight, Mystic Orchid, Orange, Orchid, and Pink Topaz. A stud earring is simply a compact non-dangling earring with one or more gemstones in the design. Men and women can wear stud earrings and the cuts are usually round, square, emerald, cushion, heart-shaped, baguette, rose, princess. trillion. Any cut that maximizes the gemstone brilliance. What studs may not have in size they should have in sparkle and fire.